If there’s one thing political centrists claim to value, it’s compromise. It’s “the way Washington is supposed to work,” writes Third Way’s Bill Schneider. “Centrists, or moderates, are really people who are willing to compromise,” The Moderate Voice‘s Robert Levine tells Vice. What does this mean when it comes to health care and the developing lefty push for Medicare-for-all? The fresh new centrist health-care organization, the Partnership for America’s Health Care Future (PAHCF), says it is a “diverse, patient-focused coalition committed to pragmatic solutions to strengthen our nation’s health-care system.” In keeping with the moderate #brand, PAHCF may not support Medicare-for-all. But perhaps they might support a quarter-measure compromise, like allowing people under 65 to buy into Medicare? Haha, of course not. Their offer is this: nothing. Valuing compromise in itself in politics is actually a rather strange notion. It would make a lot more sense to determine the optimal policy structure through some kind of moral reasoning, and then work to obtain an outcome as close as possible to that. Compromise is necessary because of the anachronistic (and visibly malfunctioning) American constitutional system, but it is only good insofar as it avoids a breakdown of democratic functioning that would be even worse. However, “moderation” is routinely not even that, but instead a cynical veneer over raw privilege and self-interest. The American health-care system, as I have written on many occasions, is a titanic maelstrom of waste, fraud, and outright predation — ripping off the American people to the tune of $1 trillion annually. Deep-pocketed hospital, insurance, and other lobbies are plotting to crush progressives’ hopes of expanding the government’s role in health care once they take control of the House. The private-sector interests, backed in some cases by key Obama administration and Hillary Clinton campaign alumni, are now focused on beating back another prospective health-care overhaul, including plans that would allow people under 65 to buy into Medicare. Behind the preposterously named “PAHCF” stands a huge complex of institutions that benefit from the wretched status quo. This includes the PhRMA drug lobby (Americans spend twice what comparable countries do on drugs, almost entirely because of price-gouging), the Federation of American Hospitals (Americans overpay on almost every medical procedure by roughly 2- to 10-fold), the American Medical Association (U.S. doctors, especially specialists, make far more than in comparable nations), America’s Health Insurance Plans, and BlueCross BlueShield (the cost of average employer-provided insurance for a family of four has increased by almost $5,000 since 2014, to $28,166). The human carnage inflicted by this bloody quagmire of corruption and waste is nigh unimaginable. Perhaps 30,000 people die annually from lack of insurance, and 250,000 annually from medical error. America is a country where insurance can cost $24,000 before it covers anything, where doctors can conspire to attend each other’s surgeries so they can send pointless six-figure balance bills, where hospitals can charge the uninsured 10 times the actual cost of care, where gangster drug companies can buy up old patents and jack up the price by 57,500 percent, and on and on. One might think this is all a bit risky. Wouldn’t it be more prudent to accept some sensible reforms, so these institutions don’t get completely driven out of business? And so we see with the Big Medical lobby. The vast ziggurat of corpses piled up every year from horrific health-care dysfunction is just a minor side issue compared to the similar-sized piles of profits these companies accumulate — which they will fight like crazed badgers to preserve. As Paul Waldman points out, this means a big resistance to the prospect of doing anything at all, let alone Medicare-for-all. However, the political implication is clear. If compromise is impossible, then liberals and leftists who want to improve the quality and justice of American health care should write off the corrupt pseudo-centrists, and go for broke. Democrats should write a health-care reform bill so aggressive that it drastically weakens the profitability of Big Medical, and drives many of them out of business entirely. If you cannot join them, beat them. America’s health-care debate is entering a new phase. 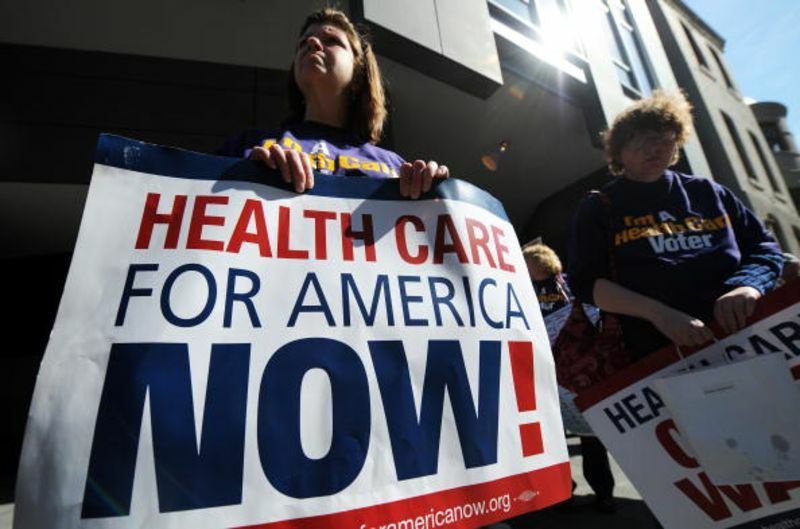 Liberals, inspired by self-described socialists such as Senator Bernie Sanders and Representative-to-be Alexandria Ocasio-Cortez, are excited about the possibility of “Medicare for All.” Republicans have at the same time largely abandoned efforts to enact major reforms of health care. This new phase of the debate is full of opportunity for Republicans, and peril for conservatives. But perhaps it would be better to say that the debate is reverting to an older pattern. For roughly four decades, liberals have highlighted the flaws of the existing health-care system, chiefly high costs and unequal access, and proposed increased governmental involvement as the solution. Conservatives talked up the dangers of bigger government, chiefly even higher costs and the disruption of existing arrangements, and reminded voters of the virtues of the status quo. Most of the time, health care has been a back-burner issue, and discontent with the system has been a modest source of political strength for liberals. When health care has become a dominant issue, however, public fear of disruption has helped conservatives. From 2009 through 2016, Republicans were able to exploit public unhappiness with the changes that Obamacare first threatened to make and then did make. Both times the public’s fear of change was turned against Republican politicians, who did not like the pressure one bit. Most of them are relieved to have dropped their party’s Obamacare and Medicaid proposals. They are eager to settle into the familiar role of criticizing liberal health-care proposals. There’s plenty to criticize. In polls, most people say they like their existing insurance policies — which may be a way for them to signal to politicians that they fear their meddling with those policies. The single-payer plans that are ascending among Democrats would by definition threaten most existing coverage. These plans pose much bigger political risks than Obamacare did. Obamacare was carefully designed to insulate Democrats from charges that they were turning people’s coverage upside down. In selling the legislation, President Barack Obama spent much of his time reassuring people that they could keep their doctors and their insurance plans if they liked them. The law mostly avoided changes to the employer-provided coverage through which most Americans get health care. Yet Obamacare still provoked a backlash. That backlash was especially intense when, in the fall of 2013, it resulted in a significant number of plan cancellations. But many voters have also resented the narrower networks and higher premiums and deductibles that Obamacare has foisted on them. As even more sweeping left-wing proposals move to the center of the debate, Republicans can reclaim the advantage of opposing disruption. But they may also again be saddled with the disadvantage of being associated with an unsatisfactory status quo. They are in charge of Congress and the White House; they have been talking about reworking the health-care system for years; and they have succeeded in making significant changes, albeit much less ambitious ones than they sought. They have, for example, ended the fines on people without health insurance that were a major part of Obamacare. In addition, the Trump administration is in the process of liberalizing the rules for short-term insurance plans that do not have to comply with the regulations Obamacare imposes on most other plans. The Republicans therefore have some, and growing, political ownership of the health-care system. The more they argue against left-wing proposals to change the system, the more ownership they will have. For Republican politicians, defending even a flawed status quo is probably preferable to trying to impose disruptive changes to it. But if they adopt that position, it will mean that the only solutions on offer to popular concerns about health care will be left-wing ones. It will mean, as well, that occasionally liberals will have enough political power to enact some, and maybe a lot, of their preferred changes to the system. We will move, that is, toward a health-care system with a larger and larger degree of governmental control even as Republicans make political gains by resisting that trend. The new shape of the debate may be good news for Republican politicians, then, but it’s bad news for conservatives who favor limited government and free markets. Arguably there was a third exception: In 2011 and 2012, Paul Ryan led congressional Republicans to endorse increasing competition within Medicare as part of their budget proposals. They did not, however, attempt to advance legislation that would actually change Medicare.